Navicat Premium 12.1.10 – Combines all Navicat versions in an ultimate version. Navicat Premium is an all-in-one database admin and migration tool for MySQL, SQL Server, Oracle and PostgreSQL. Navicat Premium combines all Navicat versions in an ultimate version and can connect MySQL, Oracle and PostgreSQL. Navicat Premium allows user to drag and drop tables and data from Oracle to MySQL, PostgreSQL to MySQL, Oracle to PostgreSQL and vice versa within a single client. Also, batch jobs for different databases such as print report in MySQL, backup data in Oracle and synchronize data in PostgreSQL can also be scheduled and automated to run at a specific time. All in all, Navicat Premium can help database users to save lots of time to manage multiple databases and perform cross database data migration at their fingertips. 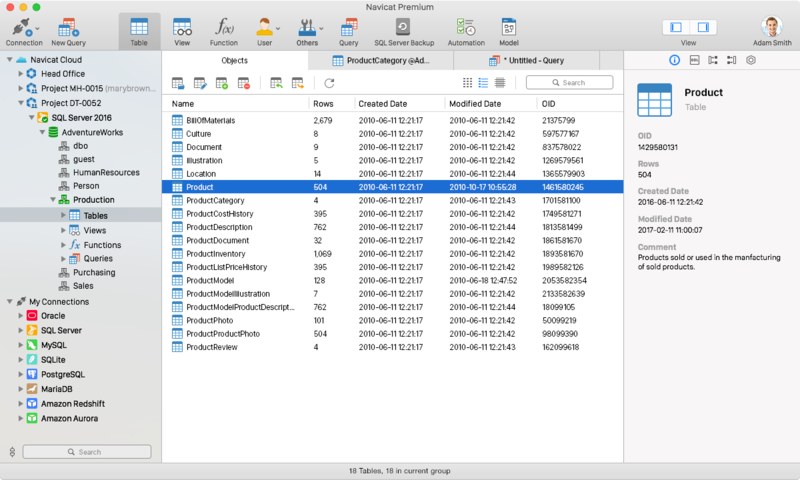 This Database Client tool runs on Mac OS X and features an intuitive interface. Other advanced features including Backup/ Restore, Data Import/ Export, Data Synchronization, Reporting and Remote Connection to MySQL, PostgreSQL and Oracle server, etc. This database migration tool provides a friendly step-by-step Wizard-GUI. All you want to do is: select a data source and a target output format, then submit migration! Next story Athentech Perfectly Clear Complete 3.6.1 – The Award-Winning, Photo-Editing Software. Previous story Twixl Publisher Pro 7.1 – Create iOS, Android, and Kindle Fire apps from Adobe InDesign. Navicat Premium 12.1.12 – Combines all Navicat versions in an ultimate version. Navicat Premium 12.0.22 – Combines all Navicat versions in an ultimate version. Postico 1.5 – A modern PostgreSQL client.